The 2017 muzzleloader deer season opens on Dec. 1. Hunters can enjoy an entire month of hunting before the season closes on the 31st. Permits are available on our website. Don’t forget that the archery deer season is still open, also running through Dec. 31. Bring your friends and family out for a satisfying holiday hunt, and remember to keep our safety recommendations in mind. 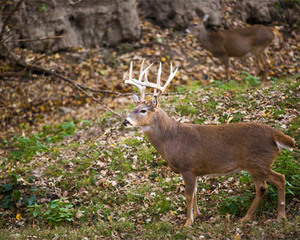 Learn more about deer hunting in Nebraska and find a place to hunt online. If you’re reading this, you probably know what we mean when we say, “Time outdoors is time well spent.” It’s where some of the best experiences in life can be had. Especially when it’s Nebraska we’re talking about. This Christmas, why not spread the love? With the gift of a Nebraska state park permit, your family and friends will have access to all 77 of Nebraska’s stunning, unique state parks, with unlimited opportunities for outdoor fun all year long. Hiking the towering buttes at Fort Robinson State Park? 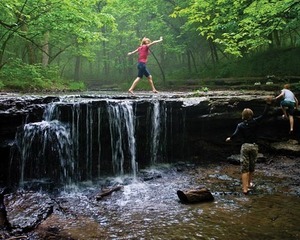 Dipping your toes in the waterfall at Platte River State Park? Camping amidst blazing autumn color at Indian Cave State Park? It’s all there, wrapped up in a single piece of paper. Easy to buy, easy to wrap, park permits are available now online and at all of our permitting offices. But it’s not your only outdoor gift option. Check out the Nebraska Game and Parks holiday gift guide for even more ideas sure to please the outdoorsman or outdoorswoman in your life. The Nebraska Game and Parks Commission reminds hunters they must first gain permission before hunting on private property. GPS mapping applications are a popular tool with many hunters. These apps may show some properties as public lands, such as the School Trust Lands held by the State of Nebraska. However, these school trust lands are leased by the Nebraska Board of Education Lands and Funds to private individuals and require permission to access them for hunting. Nebraska conservation officers have received an increased number of trespassing complaints across the state because hunters are hunting land they believe is publicly accessible when it is not. Game and Parks encourages hunters searching for publicly accessible properties to use the 2017 Public Access Atlas available online and from Game and Parks permitting offices. Hunters are responsible for verifying that land is public or private before they hunt them.